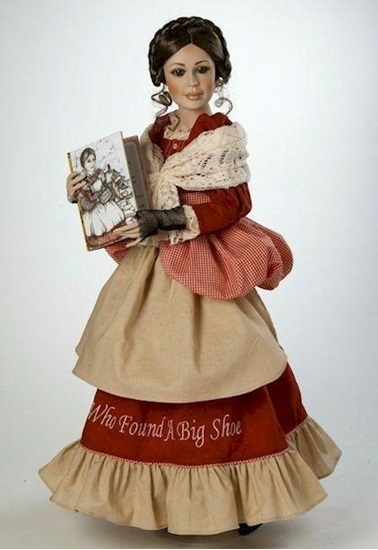 As seen on Marie's QVC Special on August 12, this 24-inch statuesque doll is a must have for any collector..
We are pleased to share the "Bold Woman Who Found A Big Shoe", Marie Osmond's interpretation of the classic fairy tale. This is a 24-inch statuesque porcelain and cloth doll with brown hair and brown eyes. She is dressed in a red and tan corseted dress with gingham accents and lace details with the verse "Bold Woman Who Found A Big Shoe" written across the hem of the dress. Black, fishnet fingerless gloves, and black lace up boots complete this ensemble. She is a limited edition of 325, comes with the Manufacturer's Certificate of Authenticity, and has Marie's facsimile signature on the back of her neck. For your enjoyment, you can find a complete version of Marie's clever tale tucked inside the faux book that comes with the doll.